Was Guns N’ Roses’ Music Sexist? 09/12/2018	Music News Comments Off on Was Guns N’ Roses’ Music Sexist? 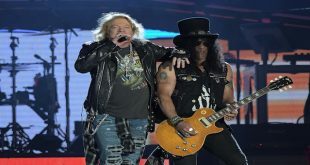 Recently reunited Guns N’ Roses guitarist Slash was asked if the band’s music had “aged well” in the modern era of music with the #MeToo Movement. After a very successful tour of the world Gun N’ Roses guitarist Slash recently gave his thoughts on doing new music with the band. Off Guns N’ Roses’ Appetite For Destruction: Locked N’ Loaded box set the acoustic version on “Move To The City” gets its own lyric video. This new release is part of Guns N’ Roses’ Appetite For Destruction: Locked N’ Loaded box set that’s out today (June 29th). The newly remastered Guns N’ Roses Appetite For Destruction album with tons of previously unreleased material comes out Friday, June 29th.